I didn’t really intend to participate in the next cookbook challange for Vegan Sandwiches Save the Day. I tested many of the recipes from this book and I like to use the cookbook challenge to spur me on to try new things. I make no secret of the fact that this is one of my favourite cookbooks from two of my favourite people. However, just as a coincidence really I did end up making 4 new sandwiches over the challenge period. I will start by saying that the photographs in this book are as beautiful as mine are dreadful, so please take a look at them for a far better idea of how the sandwiches should really look! First up was the Jimwich. It really astonished me that I hadn’t made this before but my husband suggested making it and I certainly wasn’t complaining. 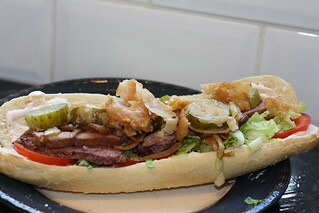 It’s made up of seitan, BBQ onion and topped with battered fried pickles. I loved it so much, especially the crispy pickles. Next I made the Kati rolls, or half made them. I did make the filling but I can buy really good chapati at the Indian shop close to me, and it was a worknight so I decided to go the easy route instead. The sandwich was still really good and if you’re not a bread person the filling would be great served with rice too. I’m not sure why Flickr is being an arse about my next picture but you’re not missing much, on the picture front anyway! This is the North End Grinder, which is made from either home made or store bought cold meats, salad ingredients and a simple but incredibly tasty dressing. Easy to throw together, great hot weather food, there’s nothing about this not to like (especially the gobbler slices; I had some that had been in my freezer for ages but they still worked very well). 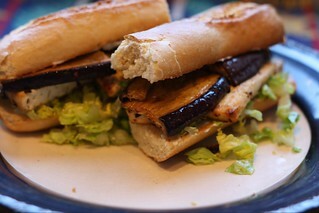 Finally, the marinated aubergine sandwich. This was another one that escaped my notice during testing and I’ve no idea why. There’s a mistake in the book too; you’re supposed to cut your tofu into much smaller slices. You can probably get 12 but the way tofu is shaped here gave me 8. 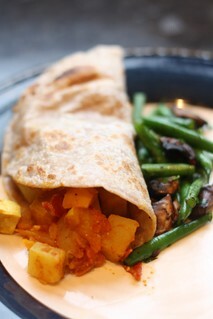 The aubergine in this is fantastic and I bet there are lots of other ways you could use it too. 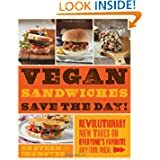 All in all, I would say the Vegan Sandwiches Save the Day is a book you can’t be without. There’s a sandwich for every occasion – they’re hot, cold, open faced, sweet, savoury, time consuming, quick and easy, wraps, rolls, and everything else you’d want from a book about sandwiches that just happen to be vegan. 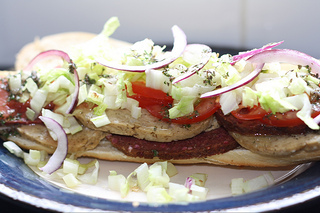 This entry was posted in Vegan Sandwiches Save the Day by efcliz. Bookmark the permalink. I’ve heard a lot about this book and am more and more tempted. I don’t usually of myself as much of a sandwich person but that’s probably because I need some sandwich guidance! Especially like the look of that marinated aubergine/tofu one. I really, really don’t use this book enough. I love everything I’ve tried and now I want that aubergine sandwich RIGHT NOW!